An AR doe is one that has met minimum production requirements while on DHIR test. Part of the recognition of the record is the awarding of a *M for that particular doe. production levels (as shown on chart titled, ”AR DOE REQUIREMENTS”) in the ADGA guidebook are all AR does. There are other ways in which a doe can earn the designation of *M without being an AR doe. They are: 1) by earning required points at a One-Day Milking Competition, or 2) on the basis of progeny (several different combinations). For complete details on the *M designation, refer to the ADGA Guidebook. *M can be earned on the basis of Milk, Butterfat OR Protein. (on the maternal side of her pedigree) of animals that qualified for a star. 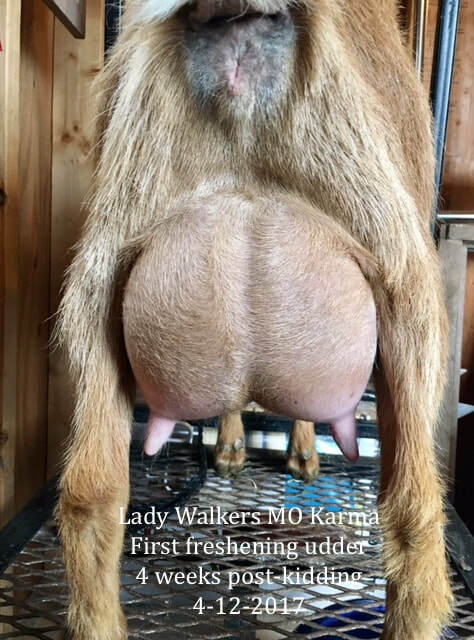 For example, a 3*M means the doe, her dam, and her maternal grandam are all star milkers. The stars do not all have to be earned in the same fashion to be counted as consecutive. 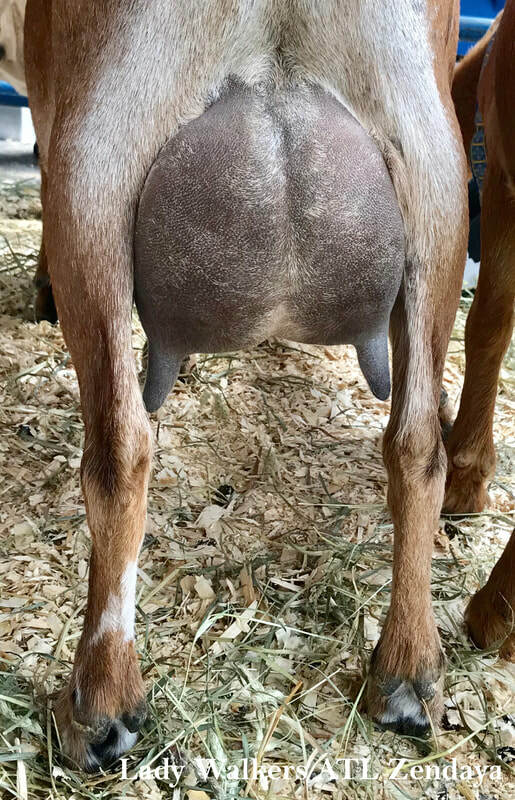 A doe with *D is a doe that has a milk star. It could have been earned at a one-day test or via 305-day milk testing. A doe with 2*D, or 3*D, etc., indicates the number of generations of milk stars. 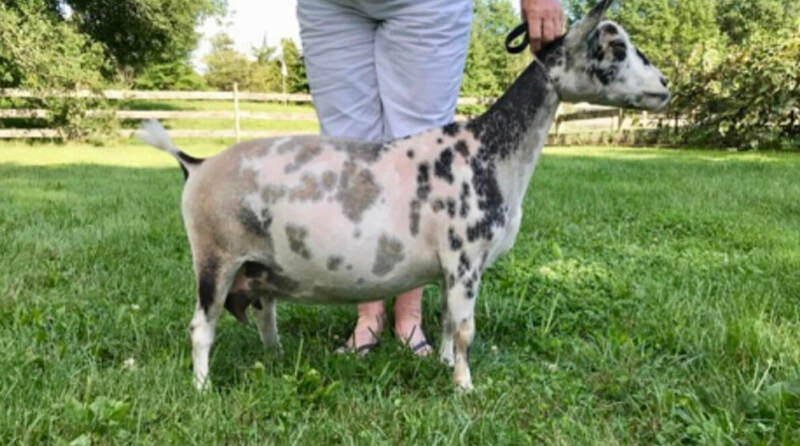 A doe with a 2*D means the doe and her dam both have their milk stars. There are some 9*D or 10*D does out there. They are rare, but that means nine or ten generations of does with milk stars. 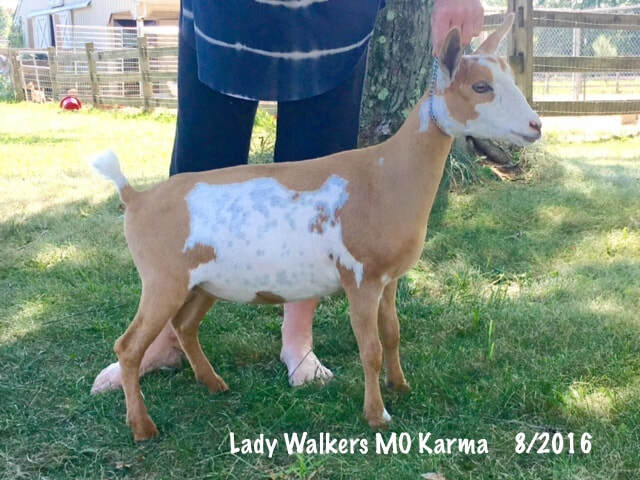 A buck with a *S has a *D dam and a +S sire or sire with a *D dam. A buck with +S means he has three daughters with milk stars. ​5-23-2016 Single doe kid - 147 days gestation. 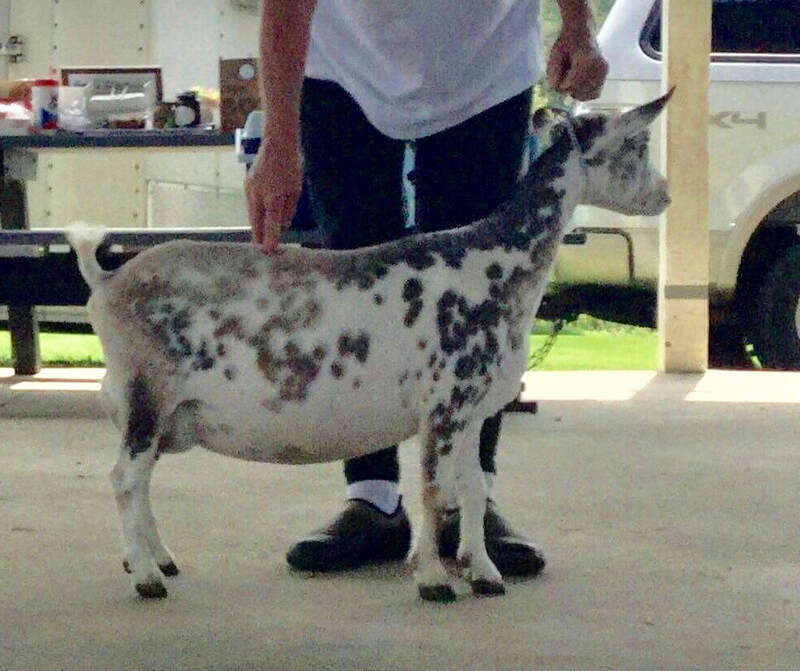 At 2018 Linear Appraisal, 19.5" at the withers. 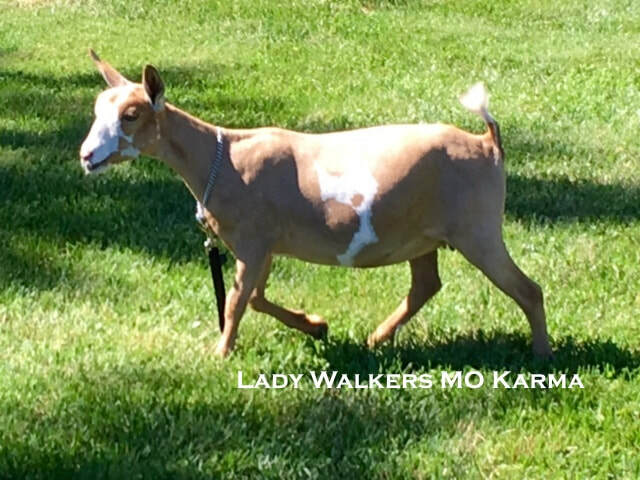 In April 2019, we had the opportunity to purchase Cleopatra from friends in PA .
Cleo is the daughter of Lady Walkers SB Jordan Tomboy and Dreahook AF Jimmy Choo, a wonderful buck we owned for years. 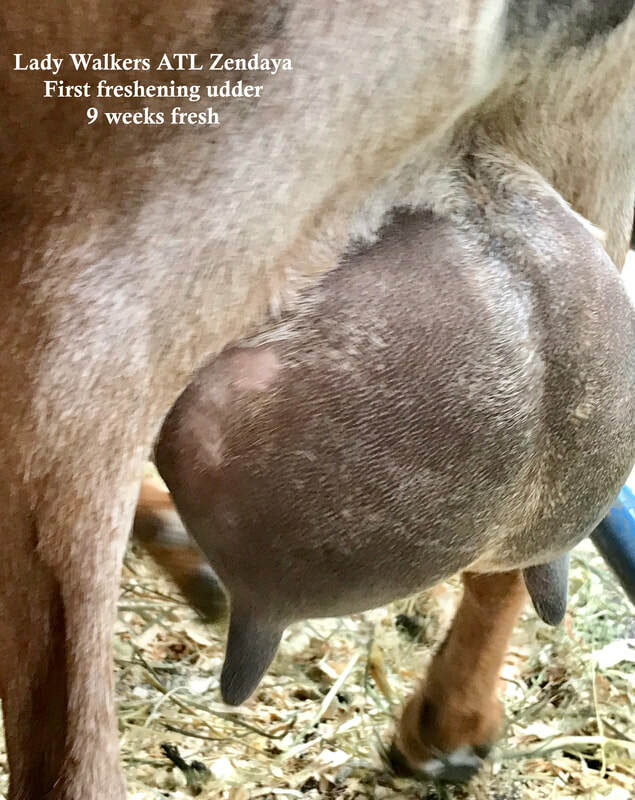 Below you will find a photo of Cleo's first freshening udder. We were wowed when we saw it! Cleo is a refined, blue-eyed beauty.